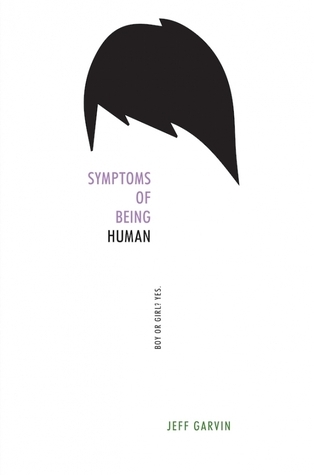 Google+ Reading Teen: SYMPTOMS OF BEING HUMAN by Jeff Garvin // A Book EVERYONE Should Add To Their TBR Right Now.. SYMPTOMS OF BEING HUMAN by Jeff Garvin // A Book EVERYONE Should Add To Their TBR Right Now.. I am still trying to process my thoughts and feelings about this book. I had never heard of the term “gender fluid” before so I was very curious to read a story about it. I wanted to understand and see if I could understand more about the term so that is why I was very happy to pick up Symptoms of Being Human. I probably should have braced myself better for this book. This is the beautiful and honest story of Riley, who happens to identify with both male and female genders. That means Riley could dress as a boy one day, and a girl the next. Riley struggles every single day with being judged by society. Riley also has a difficult time coming out to his/her parents. I say it like that because the author never tells you Riley’s actual gender and that is because it is not the point of the story. This is a story about society labeling everyone and being forced to live within those labels. Ultimately, I learned a lot from this book. Reading about how stressful life is (or could be) for a gender fluid person, how to accept yourself and for your friends/family/society to accept you as well. There is also fear, depression, and anxiety involved. This story has Riley going through some extremely difficult situations, some that made me slightly uncomfortable. Make no mistake, this story is incredibly well written and had me on the edge of my seat the entire time. I was so engrossed in what Riley was going through that I finished this book in one day. There is one thing that bothered me about this book – the fact that Riley never actually said anything, good or bad. Riley was always moments away from “coming out” but never quite did. That bothered me but it did not make me stop the book. I truly enjoyed reading this story and am very glad that I did. This was a four star read for me. I recommend everyone add it to their TBR list right now and read it as quickly as they can.